Right now, our garden is providing us with a small mountain of butternut squash. We have more of it than we know what to do with. As a result, we’ve been eating a lot of it lately and experimenting with it in different ways. Of the things we’ve tried, this was the most enjoyable result for the time and extra money invested. 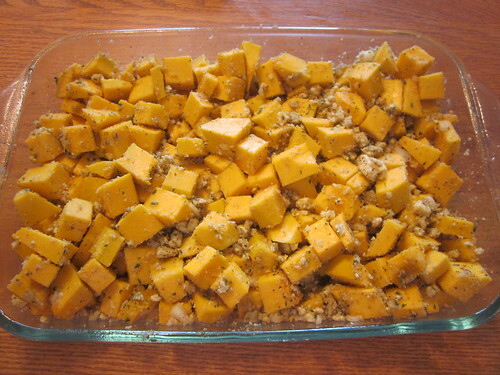 You merely need bread crumbs (3/4 cup, separated into 1/2 cup and 1/4 cup), a small yellow onion, one butternut squash (roughly 3-4 lbs. 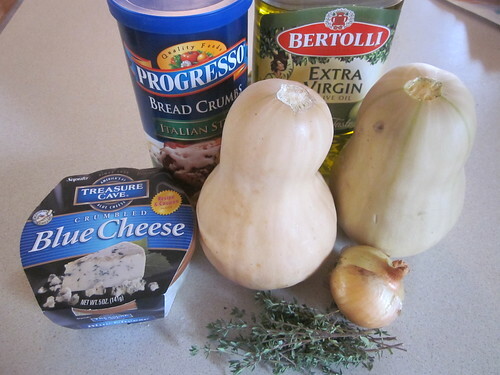 in size), 1/4 cup extra virgin olive oil, six ounces of crumbled blue cheese (the only remotely expensive part of this meal), and a tablespoon of minced fresh thyme (you can use dried if you have it). You will also want some sea salt and crushed black pepper to taste. You can prepare the entire dish ahead of the time and keep it in the refrigerator, just adding perhaps five minutes to the total baking time below. Barring that, there are two things I would do in advance. 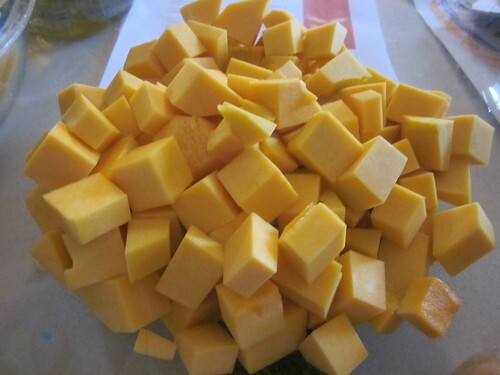 First, I would peel and cube the butternut squash into relatively small cubes, like these. I would also chop the thyme if you’re using fresh thyme in the recipe. First, preheat the oven to 425 F. The prep won’t take long here, folks. 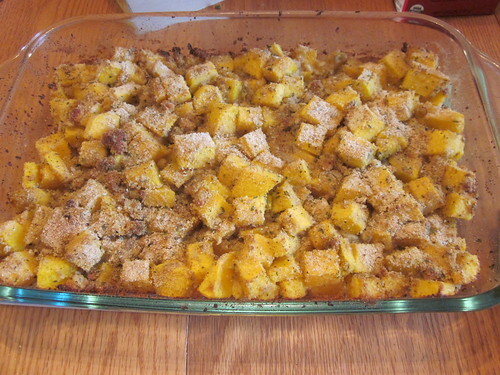 Toss together everything but the spare 1/4 cup of bread crumbs in a large mixing bowl until the squash is fully coated. Spread the mixture into a 9″ by 13″ baking dish, spread the remaining 1/4 cup bread crumbs on top, then bake for 40 minutes. Pull it out and you’re ready to eat! 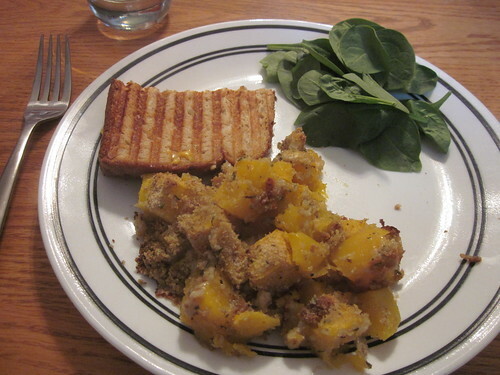 We served the meal with a small spinach salad and a simple pressed sandwich. The easiest thing to substitute here is the cheese. If you’re not a fan of blue cheese, you can use other similar soft cheeses such as feta. You can even experiment and use other cheeses like mozzarella if you so choose. As always, use what you have on hand instead of buying stuff.